It is often when year-end holidays hit, if my body and soul feel not maligned, the mood shifts to mellow and I tend to gravitate to metal music less extreme and more melodic (last week’s JJ Hrubovcak’s Death Metal Christmas a very welcome exception). I can hardly call myself an expert on progressive metal, but one band practically never failed my expectations, so over the years I have collected a large part of Danish Royal Hunt discography. This year the new album A Life to Die For hit at the very opportune time providing lots of listening pleasure, and has been my soundtrack over the last couple of weeks. Even if this is going to damage my reputation with the more extreme metal readers of the site I will proclaim that I am an unabashed and biased fan of Royal Hunt. Truly, what is not to like, the band has been a steady producer of quality melodic metal over the years and came back stronger than ever with the previous effort Show Me How to Live, also reviewed by me hereby and also receiving high marks. A couple of good things happened to Royal Hunt on that album. Vocalist DC Cooper came back with his signature voice, and the band’s mastermind Andre Andersen discovered his love for big symphonic production. Those two good things remain with the band on A Life to Die For. DC Cooper maintains his fine form, hitting high notes when he has to (title track, Hell Comes Down from Heaven), soaring along with the large scale chorus himself occupying a proper ledge in the polyphonic closure of A Bullet’s Tale, or taking on the storytelling role with the velvet in his voice ( Hell Comes Down from Heaven, Sign of Yesterday). The man and Royal Hunt are simply a winning combo and the two together are more than just a sum of two parts. Further, if you thought the production of Show Me How to Live was big, than A Life to Die For goes even bigger, more orchestral, and reaching something on the scale of grandiose. I have no idea how this can all be reproduced live, or even if it is going to be ever attempted, but if you are a fan of modern polished production A Life to Die For provides just the type of sound. The examples of that are numerous. Opening drumming on Hell Comes Down from Heaven is akin to something I only heard in one place, while visiting Epcot Park in Disneyland and stopping by the Japan pavilion where young girls put on the show. And Weather Channel should seriously consider commissioning Mr. Andersen for a music spot if he can write melodies as in intros to One Minute Left to Live, but especially Sign of Yesterday. Somehow Royal Hunt managed to sound almost kind and comforting here, without losing sight of their rock origins, shifting to harder realms on Running Out of Tears and Won’t Trust, Won’t Fear, Won’t Beg. Sure, A Life to Die For is still no Paradox. I could be looking for one forever never to hear it again. Actually, Hell Comes Down from Heaven attempts to deliver Message to God meaning, only lyrics are now a lot clunkier, something my 13yr writes better for her Honors English. It is also true that songs are on some level become expected, and the approach to songwriting repeats, in a pair of the most recent albums, and from song to song on A Life to Die For. There is a table-setting intro, simpler rocking worse and out of this world catchy chorus. A Bullet’s Tale epitomizes this best, while I could not reconcile the childish happy sounding chorus of Running Out of Tears with its more muscular verse. The tempo is mostly mid- to a little faster, with only Won’t Trust, Won’t Fear, Won’t Beg being borderline balladic in spots, set to a heftier guitar riffs. Just about every composition has a place for Royal Hunt musicianship to shine as well, but these bridges, arpeggiated solos and flights of the bumble bee do not distract in any way and are never pure show-offs. I began my write up by saying this and will close in the same way. 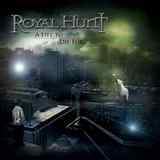 Over the years Royal Hunt has become my comfort music. I always know what to expect, and the quality is certainly here all the time. These guys are professionals of the highest order, who now know how to put a sense of drama in their keyboard oriented orchestral melodies.